Virtual Reality has – again – become the target of substantial interest, research and industry growth. 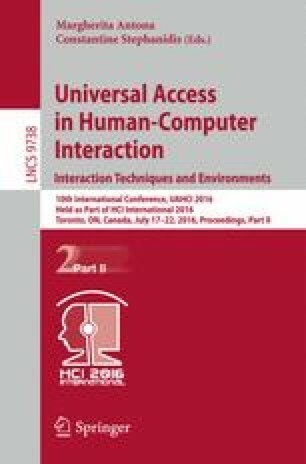 In the current market situation it is aimed at a general audience rather than expert users and therefore requires a fundamental rethinking of how we conceive of human computer interaction in Virtual Reality. In comparison to the established methods of designing interfaces for the desktop environment and for mobile applications numerous changes need to be considered. Even though the use of metaphors has become looser and more abstract, it is still the common way of providing an easily graspable conceptual model of the functions and behaviors of an application, be it an operating system or a task-oriented application. How do metaphors work in Virtual Reality? How does the relationship between the metaphorical environment and the environment of operation change? What kind of cognitive support structures are necessary for the perceptual situation of Virtual Reality? Drawing from an interdisciplinary set of theories we will address these questions through high-level analysis and develop methodologies to recast the design principles for the creation of user interfaces for Virtual Reality.